This is one of three ocean view units within a triplex. Come stay at one of the best located and nicest ocean view condos in all of downtown Pismo Beach. La Casita de Amelia (Condo A) is a beautiful location in the heart of downtown Pismo Beach. It is located at 350 Harloe Ave. approximately 2 blocks to the ocean. You are walking distance to the beach, restaurants, pier and parks and just about anything else you want to do here. The longer stays of 30 nights or more take priority. Ask about shorter stays in the comment section of an inquiry. Condo A is named La Casita de Amelia, within the Tres Tesoros Tri-Plex complex. Tres Tesoros means three treasures. This treasure has two bedrooms/two-and-one half bath with a gas log fireplace in the family room. The ocean view condo has a large family room for entertainment with a flat screen television. There is also a flat screen in both the master bedroom Cal King Room and guest Queen Room. There is a private bath in the Queen room with a shower, sink and toilet. The king room has a full bath outside the bedroom. There is a full kitchen off the large family room and half bath on main level. The family room has a sofa, one large wide chair and ottoman, coffee table and dining table seats six. The condo is fully furnished with all the necessities of home and maybe more. There is a wraparound balcony with chairs and table to relax and enjoy the views up and down the coast. There is a built-in-shared gas BBQ and foot wash, iron and ironing board, washer and dryer in the 2 car garage, Wi-Fi and DirecTV. No Pets, No Smoking. This condo sleeps 4-5 maximum occupancy, which includes an infant in a pack n play. To view all the condos, please see my other listings. Condo B is VRBO# 195574 and Condo C is listing # 195618. Inquire to owner/property manager. Property is also viewed Treasures Vacation Rentals and Hacienda Vacation Rental. My husband and I completed construction on Tres Tesoros in 2006. We spent about a year designing the Tri-plex. We named the building Tres Tesoros after our three children. Each condo is named appropriately after one of them. We have Condo A... La Casita de Amelia, Condo B... is La Casita de Bailyn and lastly, Condo C is La Casita de Colton. We also have some other properties located just south of Pismo Beach in Oceano, CA. full bath on the 3rd floor outside of bedrooms. Half bath on the family room level. Walking distance to downtown, restaurants, bars, shopping, beach, etc. Walk to the ocean from the condo. We have a few towels for the beach and towels in the unit for inside use and bathing only. Some available. We do not supply them but we don't remove them when left in the unit, unless they are expired. In family room, master bedroom and guest room. In nearby cities of Arroyo Grande, Avila Beach and San Luis Obispo. There is no elevator, only flights of stairs to a landing and then another flight of stairs to the front door. Both bedrooms are on the third level. There is an exterior foot wash to rinse off feet and boards. Shared built-in gas BBQ at the end of the driveway. This is a BBQ used by all three condo occupants. This condo is nicely decorated. Very useable kitchen and nice to have access to the shared BBQ. The king bedroom is very comfortable. Nice having a half bath on the main floor. The balcony on the main floor is nice with a peek-a-boo view of the ocean. Great views from the bedroom balconies. Even though it’s between Hwy 101 and the PCH, Harlow is a quiet street with quiet neighbors. The garage is spacious, including a nice full size washer and dryer. Nice to leave the car in the garage and walk to so many restaurants....especially on the weekends. Would give it a 5 if there was beach access at the end of the street. Steps are about 2 blocks to the right or left. Not far, but takes some planning if you’re carrying chairs, cooler, etc. We stayed as a couple and there was plenty of room. With a shared bath on the bedroom floor it would be good with a family with kids. Not so sure with 2 couples. A bit close. Thank you for choosing our property for your stay and letting us share your experience with others. We know there are many options of places to stay... we try and stand out as a top place in Pismo Beach. We strive to have our guests take home fond memories and truly hope that the next time you and your group think about a Central Coast property you think of Tres Tesoros and Treasures Vacation Rentals. We treasures our guest reviews! This place is a hidden jewel and full of delightful surprises! First of all, the Tres Tesoros condo is spacious, comfortable, and clean! There are decks and windows that afford views of the Pismo beach ocean and hills. It is bright and airy and in a great location. - It is a block from the beach, so you can walk with your surfboard, boogie board, or sandals. No need for a car. - It is a 20 minute bike ride to Avila beach, 40 min to San Luis Obispo and for the 3 weeks I was here I had no need for a car. - There is a great gym across the street (Pismo Beach Athletic Club) where you can buy visits for as little as $6/visit which has a great weight room, racquet ball, spin and aerobic classes, and even a pickle ball court! -> Flagship. Casual seafood restaurant literally across the street with inexpensive food and cocktails. Fun for the kids (old and young)! -> Penny's. Best breakfast you've ever had! -> Chop Street. Great burger and beers! -> Ventana. Fine dining with a million dollar view. We went two Saturdays in a row it was so good! You have to try the jalapeno margaritas!!!! -> The Oyster Loft. On the water next to the Pismo Beach pier and one of the best meals we've ever had. -> 10 min card ride from San Luis Obispo which has many incredible eateries and fun shops, as well as the biggest Farmer's Market you've ever seen (6-7 blocks long) on Thursdays from 6-9pm. And to top it off the owner, Marian, is a great and gracious host! We stayed in Condo A and C. Everything was perfect. Everything you could think of was supplied in the kitchen and the bathrooms. Towels were large and soft, beds were comfortable. Location was with in walking distance to beach and restaurants. My only problem was the gas grill didn't have enough flame and was hard to start. Overall we had a great time and would book again. Good to know about the gas grill. If I had known before now, I would have had it serviced. I've got a service call in now! So by early this week, we should have much better flame! We try our very best to make sure our places are well maintained. Sometimes there are things that do occur while a guest is there and we always try our very best to remedy ASAP. Thanks and we look forward to having you choose one or multiple Treasures Vacation Rentals for your next visit to this little piece of paradise. Glad everyone had a wonderful time. This is what we strive for! Our family stayed in Condo A for a week in August. The property exceeded our expectations - it was very roomy, clean, well stocked, beautifully decorated and comfortable. Location is very close to the beach and walking distance to the pier and many area restaurants. We hosted a large group for dinner and enjoyed the ocean view, well appointed kitchen and gas grill. We will definitely stay there again! Great location and beautiful condo! Very clean, nicely decorated, everything my family needed! The owner was fantastic to work with and recommended tons to do as well as restaurant suggestions. My family and I enjoyed our stay and will definitely come back! 15 minutes to wineries! 1.5 blocks to the beach and we are in the heart of downtown Pismo Beach. 8 minutes to Cal Poly San Luis Obispo, 20 minutes to Santa Maria. 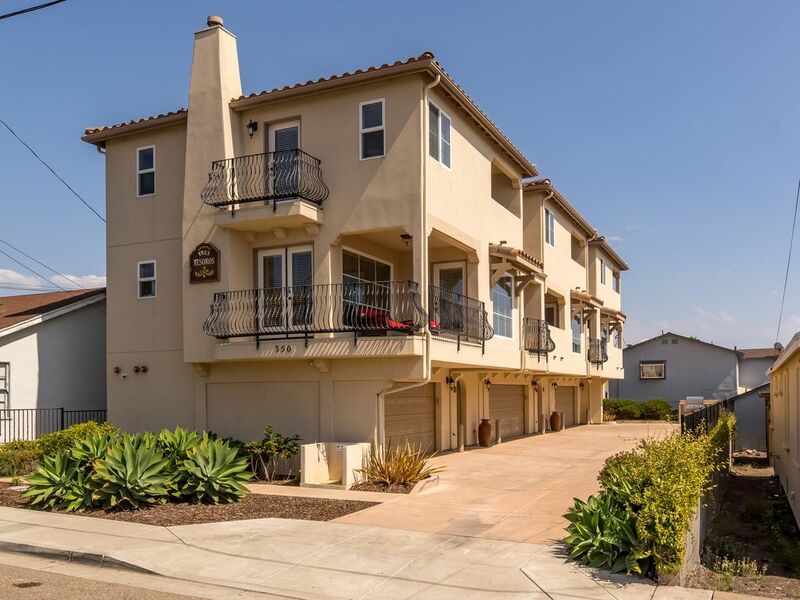 This property is in the heart of downtown Pismo Beach in San Luis Obispo. Just two miles south are the Oceano Dunes where you can ATV. Pricing is subject to change until booked. NO PETS OR SMOKERS. Minimum age to rent is 25 years of age. Some holidays and special events require longer than 3 night stays. Off season we do consider 2 night stays or more. Please inquire and also view our other properties. VRBO# 195574 is a two bedroom, 2.5 bath. VRBO# 195618 is a 3 bedroom, 3 bath in the same complex. Pricing subject to change until reserved.